Can a fetch land fetch old dual lands? theres an easier way to link decks. its explained in the comment tutorial. judging by your description of the deck, im guessing you're relatively new to the game. 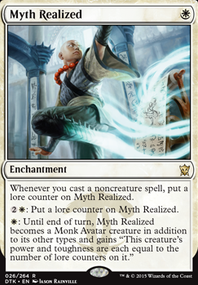 as such, i'd refrain from choosing the "modern" format for your deck, and instead pick "casual". modern is a brutal format where games are usually decided by turn 4. for exaple, an Emrakul, the Aeons Torn can come down with haste on turn 3.
as for improvements on the deck, better dual lands go a long way. fetch lands like Marsh Flats , shock lands like Godless Shrine , and check lands like Isolated Chapel . you can also grab Mutavault , which counts as a warrior. 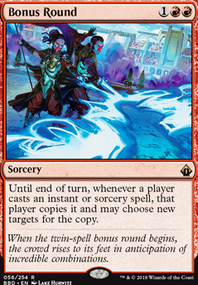 if budget isn't a problem and you can afford the dual lands, a 3rd color could be added. in that case, i'd recommend red for Lovisa Coldeyes , as well as good removal/interaction like Terminate , Lightning Bolt , or Lightning Helix . or if you want to stay aggro and creature heavy, green gives Collected Company . just make sure all your creatures are cmc 3 or less. Aether Vial is great in creature heavy decks. it lets you put multiple creatures into play per turn, as well as at instant speed. this lets you Vial in creatures at your opponents end step to help dodge removal and also grant pseudo-haste since the creature will be able to attack on your following turn. 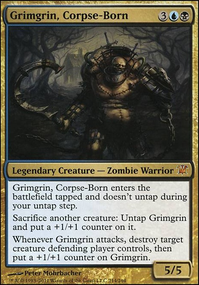 and since the creature isn't being "cast", it can't be countered. 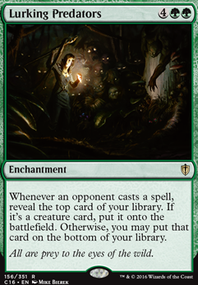 in modern, a deck needs to be able to win turn 4 if not interacted with, or it needs to pack a ton of interaction on its own. examples of interaction in your colors would be Path to Exile , Cast Down , and Thoughtseize . Vault of the Archangel and Westvale Abbey Flip can be very very very nice in this deck !!! You are running 4x Serra the Benevolent , in this case i don't think that you really need Gideon, Ally of Zendikar and Sorin, Solemn Visitor (I know that they are very good but Serra the Benevolent is the best by far). 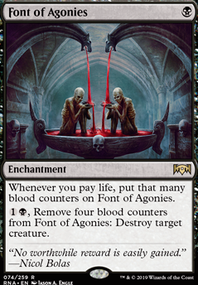 Sorin, Solemn Visitor is good because the +1 lifelink but if you use Vault of the Archangel .......is the same idea. Remove 4x Zealous Persecution for 3x Path to Exile and 3x Fatal Push . 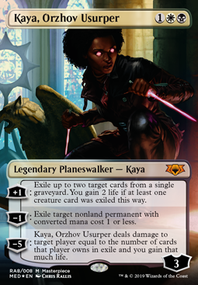 Drana, Liberator of Malakir and Elesh Norn, Grand Cenobite amazing cards but we have Angel of Jubilation and Celestial Crusader (they are more effective). Finally, I would like to say that BW tokens is an amazzing deck because of Thoughtseize and Inquisition of Kozilek on early game. If you don't wanna use this 2 cards, run to mono white tokens (Cheaper and more aggressive. With the deck manipulation granted from Dragonlord Ojutai you should add Devastation Tide and Terminus for board wipes. Maybe even Entreat the Angels as a game finisher. 1) The rest of the Fetchlands: Arid Mesa , Scalding Tarn , Misty Rainforest , Polluted Delta , Windswept Heath , and Marsh Flats . FINALLY... In my opinion the better way to build Dragonlord Ojutai would be a "voltron" control based deck. Simply beat face with a flying 5/5 which you can occasionally make stronger, but devote most of the deck to control to utilize Ojutai's deck manipulation ability to grant you a way to always find answers to opposing threats. raydenkiller on Recycling at its Finest! Thanks for the feedback, I'm happy that you like my deck :D You are right about the lands. 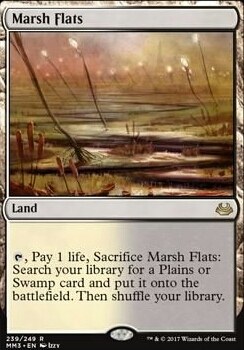 I'll look into more dual lands but unfortunately I can't add Marsh Flats ...because it costs too much money(Which is a shame because it would have been a great card to combo with Hidden Stockpile :( For the same reason it would be hard for me to add Bitterblossom . Maybe I'll put one in instead of one of my Athreos since they both cost a lot? While I do LOVE my 4x Gift of Immortality since they protect my key creatures while creating an immortal blocker that procs all my on-death effects(and its the card that made me want to make this deck xp )...I can't deny the power of Hidden Stockpile . Its ability to sacrifice my own tokens at will is great when fighting someone who knows what you're going for...Plus free tokens ^^ So ill trade a gift for a stockpile. I was wondering...do I need to worry about drawing cards? If so, a Mentor of the Meek would do wonders here, but I really don't know what I would take out for it -_-' . I was also thinking about replacing my 2x Tragic Slip with Grave Pact for unlimited removal. I know it costs 4...but it just seems so good...would that be a good move? YaBoyEvit on Recycling at its Finest! This is a neat deck. I like it a lot. If you could afford it I recommend Godless Shrine and Marsh Flats if only to increase the consistency of your mana base, since I noticed quite a few of your cards are really color demanding. I almost want to say that Hidden Stockpile is good enough to be a 4 of, and if you get the fetches, they will trigger revolt for you :) if this change is made I would recommend cutting 1 copy of Gift of Immortality , and honestly I could see all 4 copies of Gift of Immortality being cut for a few of the other cards in your maybe board, most likely Bitterblossom since a free token every turn is fantastic and offers a secondary win con OR amazing chump blockers, and the life gain taken from Blood Artist negates the life loss all together. This is a really cool deck I think you did a great job.